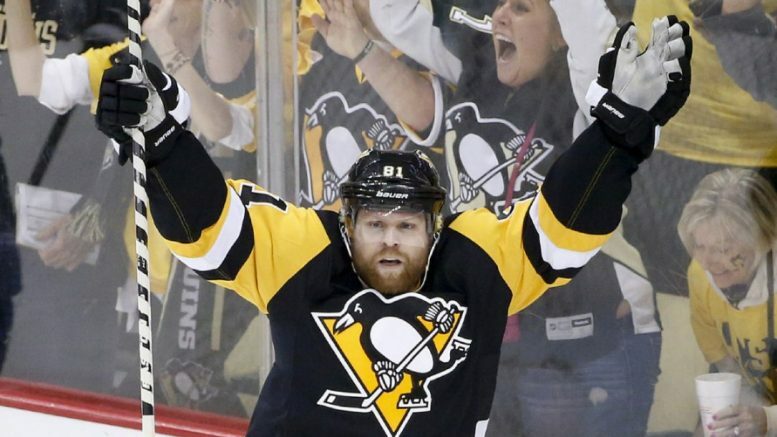 Phil Kessel and the Penguins always beat the Capitals in the postseason, but on the flip side always struggle with the Bruins. It seems like every remaining Eastern Conference playoff team has at least one kryptonite. We’ve pretty much reached the second round of the NHL playoffs, meaning we’ve bid farewell to some pretenders like the Devils, Flyers, and apparently even the Maple Leafs. Three of the four series are at 3-1, with the favorites poised to finish off their foes at home. The Capitals remain in a 2-2 deadlock with the Blue Jackets, with two of the next three (if necessary) at home. Should the Caps emerge victorious, the East will go chalk in all four matchups, with the higher seed advancing. That would leave us with a Bruins-Lightning showdown and a third straight year of Caps-Penguins. So who will reach the Cup finals? For the aforementioned quartet, the key will be who they don’t play. The Capitals are simply intimidated by the two-time defending Stanley Cup champion Penguins, who have won their second-round matchup with Washington en route to titles in 2016 and 2017. Alex Ovechkin has never defeated Sidney Crosby in a playoff series, going 0-for-3 while the Washington franchise is a collective 1-9 all-time against Pittsburgh in the playoffs. You must be thinking, so if the Caps’ kryptonite is Pittsburgh, who are the Penguins’ bugaboo? Well that would be Boston, which is a theme that has carried over from the NFL. The Steelers have won two Super Bowls in the 21st Century because they’ve avoided playing the Patriots, but Pittsburgh is 0-3 against New England in the playoffs and 2-11 against Tom Brady overall. The Penguins’ most recent playoff matchup with Boston went just about how you would expect in 2013. The Bruins swept Pittsburgh in four games, outscoring them 12-2. Including playoffs, the Bruins are 18-8 against the Pens since the start of the 2013 season. Okay, then what about the Bruins? Can anyone stop them? Glad you asked. There are essentially two teams that would look forward to facing the Bruins in the playoffs, and one of them — the Anaheim Ducks — were swept right out of the first round of the Western Conference playoffs. That leaves only — you guessed it — the Capitals with a fighting chance. How is this possible, though? The Capitals, notorious for early postseason dismissals in a city full of playoff choke artists, confident against the most charmed sports city in America? Don’t ask why, but Washington never seems to back down against the Capitals. The Caps have been the Bruins 12 straight times (! ), and also took them out in a seven-game, first-round series in 2012 when the B’s were defending Stanley Cup champs as Joel Ward — who would receive racist taunts from Boston fans afterward — notched the game-winner in OT. And where does Tampa Bay fit into this equation? That’s not quite clear yet, but the Lightning probably could match the Caps’ speed and give them fits. The Lightning lost to the Bruins in a hard-fought, seven-game Eastern Conference finals series in 2011 and went just 1-3 against them this year, and also lost a seven-game Eastern Conference finals set to the Penguins in 2016. Both times, the Bruins and Lightning went on to win the Stanley Cup. That’s not to say it would play out exactly this way, but history has a way of repeating itself. I’ve always maintained that to beat the Patriots in football, you have to beat the Patriots. That means, once you’ve done it once, the Pats’ mental edge that they seem to have over everyone is gone. That’s why the Giants, Broncos, and Ravens have had multiple postseason successes against New England, yet teams like the Chargers, Chiefs, and Steelers have never beaten them. I believe the same thing goes for the likes of the Penguins and Bruins. Unfortunately, the Caps and Penguins are going to have to change history before they become doomed to repeat it against those clubs. Be the first to comment on "Key to Winning NHL’s Eastern Conference Will Be Avoidance; Bruins, Pens, Caps, Bolts Have Kryptonites"